Sometimes a very special horse comes into our life and doesn’t stay long enough. For Carin, that horse was Eli. Back in April of this year, a big, loving Thoroughbred came to Top Notch. Sadly, he developed a sudden and strong neurological disorder in September and had to be euthanized. Carin was kind enough to share the story of her and her horse. Before I tell the story of Eli I have to add a little story about the first horse I owned. About 30 years ago I started English riding. I had always done Western riding in my younger years, including barrel racing, pole bending and goat tying. I started at North Valley Farms with Robert Foley. He found Kid Charlemagne for me, who we lovingly called K.C. He was an Appendix Quarter horse and he was mean. Once you got on him was wonderful. K.C. had a short stride but never refused a jump. We showed in the Adult/Amateur division. But on the ground, he was likely to kick or bite. Back then Laurie was a working student with Robert. To this day she tells stories about having to enter K.C.’s stall with a pitchfork for protection. I was kicked twice in the knee and bit numerous times He spooked at everything. He was so tenacious. He was hit by a car on Rio Grande. The car was totaled and the people were scared but ok. Animal control and the police were sure he was dead, and starting looking for him. But K.C. had run home and put himself in his stall. He broke a bone in his hind foot. The vet put a bar shoe on him and he was turned out to pasture for a year. When he returned he was jumping as well as he did before the accident. He was a very special horse. Twenty years later I came back to riding at Top Notch Farm. In April I started looking for a horse of my own. The transition back was more difficult than I had anticipated, and I thought having my horse would make it easier. In April, Laurie found me Eli. Then his name was Eli, and he was living at Sandia Farm with Laura Simpson. He came to Top Notch Farm on a six month lease. I renamed him Eli and I fell in love at first sight. Laurie said “Wait ‘til you ride him before you know if you love him.” But I knew. I rode him the next day and he whinnied the whole time. I thought this was adorable. Eli is an older registered Thoroughbred. In his very young years he was a racehorse. His next career was as hunter. He did the Amateur/Owner hunters in Colorado, which is a big 3'6. After that he was an eventer. After retiring from big time showing he has had several owners. I was his last. He was the sweetest, kindest horse I have ever been around. After all these years I have found the horse I have always wanted. He always stayed very clean and never seemed to get dirty. Even Jaime and Leo say that he was one of their favorites to work with; no pitchfork needed. His best friend at the barn was a little Pinto pony named little Snickers. The two old men loved to get turned out together. When I would go to see him he would nicker at the sound of my voice. He was a big boy at 17'1 and had a very nice long stride. He would lift his feet automatically when you pick them. He taught me a lot and I miss him very dearly. When Laurie tells the story of Foxy it always begins the same way. “I never just bring a horse home. Ever. But for some reason I did this time.” I suspect that reason was Rod. He’s more of a softy then you’d think. All of our NMHJA shows are held at the Expo New Mexico Fairgrounds. Just on the other side of the wall is our local racetrack. We don’t go over there much. Mostly because we’re not allowed. But there is a little feed store over there, and in 2009, Laurie needed to pick up some supplies and snuck over. I don’t know how the conversation got struck up, but I know the guy at the feed store knew Laurie. And he knew the man who owned Foxy. He knew Foxy was not being taken care of. She was unbelievably skinny. Maybe a 2 on the weight scale. He encouraged Laurie to bring her home. And if that wasn’t enough, Rod fell in love with the pretty mare. At that point he was riding and showing little Jimmy. He was ready to move up. And he’s a total softy. Technically, you cannot buy or sell a horse at the track. So Laurie and Rod snuck her through the fence. They paid a $100 for her and brought her home. At the time Luis worked at Top Notch Farm. He took one look at Foxy and asked what Fancy was doing there. Turns out Luis and his family used to own Foxy. They called her Fancy. She was fast. A big winner at the mile. She started to stock up behind and just get weird and hitchy behind. She kept on having to scratch because the vet would not clear her to run. So Luis sold her to the man Laurie bought her from. Foxy wasn’t off the trailer before Rod declared she was his horse. So he and Laurie set out retraining Foxy. It was an adventurous year. Laurie rode her a lot. Rod rode her a lot. She got a lot of love. Here she is at a Top Notch Schooling Show with Laurie a few years ago. And slowly, she started to settle in. It took three years before the speakers at the rodeo arena stopped making her excited. Two before she stopped jumping ground poles. She never learned to straight tie. She does cross-tie like a champ. Rod took her to one show. He gave her the show name Moxie. Because that girl has plenty. Foxy has turned into a barn favorite. She is the most in demand school horse. Laurie says it is because she carries herself well, so she doesn’t require a lot of leg. I think it is because people secretly like a mare with a little personality. Foxy has to be turned out with her buddy Chandler. If not she paces. She has to be stalled next to Chandler. But can’t be stalled next to anyone else. She doesn’t like them. There are about five horses in the barn that she will pin her ears in lunge at if they get too close. But that’s what makes her fun. Foxy is the queen of teaching a rider to be soft. She can take an awful lot of bouncing on her back, but do NOT hit her in the mouth. Foxy loves the long spot. If you let her choose, you’ll be leaping over the fence. 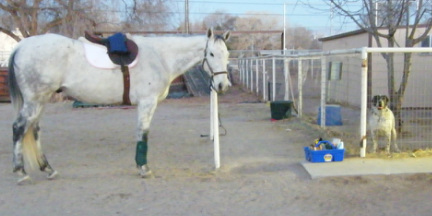 Together it teaches her riders to wait to the base of the fence without pulling. She has an adorable jump, and a pretty movement. That girl definitely has Moxie. Mr. March is my very own baby, George. Aka Mister President. How did he get such a regal name you ask? He came with the name Cloud, and before that it was Gandolf. But the moment we saw him we started calling him George. Before we bought him, before we even rode him, he was George. It just came natural. As for Mister President, well, I'm a West Wing fan. I lived in DC for years and used to be a political buff. And he kind of looks like George Washington. It's the nose, and gray hair. George was bred for the track right here in Albuquerque, NM by Joe and Tillie Cordova. When he was young, the Cordova's downsized their business and sent him to a sales barn. 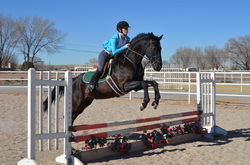 From there is hopped around, going through at least three other owners/sales barns before he was purchased from a sales barn in Los Lunas, NM and ended up as someone's baby. 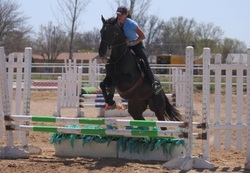 But she had human babies and after two years of being unable to really ride him she sold him to me. He never did make it to the racetrack. We found George on Craigslist. I was half looking for myself, and half looking for a friend. Because really, I couldn't (can't) afford a horse. I loved the way he looked. The next day my friend Dana and I went to see him. When I tried to clean out his back foot he kicked he. Not a powerful I-will-kill-you cow kick, but a don't-do-that-again kick. He got my hip and left a nasty bruise. I didn't try to pick out his foot again. He knew how to walk, trot and canter under saddle. He was forward and carried himself light in the forehand. And barn sour. So very barn sour. Dana encouraged me to buy him on the spot. But I wasn't willing to commit without Laurie's opinion. So the next day we brought Laurie back. This is what he looked like. Skinny, pancake feet, no neck. Yellow tail. She liked him. We bought him without vetting. He moved in that night. I paid a whole $800 for him. Want to see a video? Here is Laurie trying him. Notice how well he jumps. As in he doesn't. He has absolutely no idea that he is supposed to pick his feet up. First ride, he jigged the entire time. It took a week before he stopped trying to drag me out of the gate. He couldn't maintain the canter for more than a dozen strides. After a few weeks I went on vacation and left him with Laurie and Dana. When I came back he could jump. And you could pick up his back feet without him kicking. I don't know what they did, but I'm glad they did it. It quickly became apparent that someone had invested some time starting George. He knew how to carry himself, to frame, canter on both leads. He half-passed, side-passed and could do a turn on the forehand. He took to jumping like a duck to water. We had to be careful or we would jump when we didn't intend to. To this day he still have never looked twice at a fence. He's stopped three times. Twice I deserved it. Here he is after three months. Pretty amazing change, right? We discovered he had a natural lead change and would often change without being asked. Our winter plan was perfect that lead change and show in the spring in the baby greens. Then George became miserable. Crazy bucking. Teeth grinding. Absolute horror. Clearly something was wrong. We called the vet and the chiropractor. Turns out George had six pinched nerves in his back and poll. They were the result of an old injury and had been present for some time. According to the amazing Dr. Bill Hampton, horses will suffer what looks like a minor accident. They'll fall in turnout, or pull back at the hitching post. Nerves get pinched and it hurts to use their back and neck. They start acting up under saddle to try to avoid the pain. Their training decreases because they are miserable to ride, they get out of shape. Then they are sold off to a new owner who repeats the cycle. After one chiropractic session George was a new horse. I have never seen such a change in an animal. Both in his movement and personality. For a whole week he was awesome. Then he hurt his stifle in turnout. 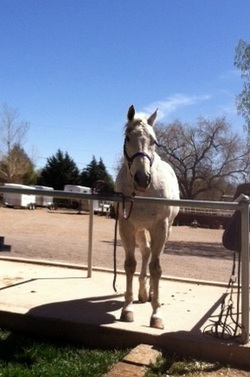 And had a month of stall rest and hand-walking. When he was sound, we had a whole new miserable George under saddle. Turns out being in a stall gave George an ulcer. Now he's back to living out, getting bit up by the pony next door and easing back into work. Here's George a week ago with his dog sister. He's fatter, happier and back to being my little jumper pony. The dog got prescribed the same ulcer medicine as George an hour earlier. He's clearly in the right family. We were totally going to figure out to select just one horse each month to brag about before we launched the website. 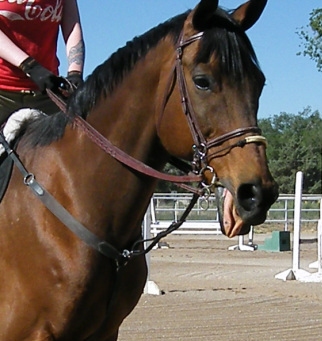 But instead we stuck our tongues out and went riding. Stay tuned and we'll get it done. I promise. And we're kind of fans of the people who own them too. So it's no surprise we wants to brag on them. Tune in once a month to see what horse we just can't get enough of at the moment.